Thursday – US – Initial Jobless Claims fell 10,000, to 202,000, for the week ending March 30, the lowest in 49 years. The Australian sharemarket fell 0.8% yesterday, after it reached a seven month high on Wednesday. Selling was broad based, with all sectors closing lower. The Energy sector led the declines; Woodside and Santos fell 2.1% and 2.2% respectively, while Beach Energy declined 4.3%. The Health Care sector was amongst the worst performers; ResMed fell 2.7%, Cochlear lost 2.1%, and CSL slipped 1.5%. Materials retreated following recent iron ore driven gains; BHP and Fortescue Metals both declined 1.2% and Rio Tinto lost 0.7%. GrainCorp gained 2.2% after announcing the demerger of its malt business. The transaction is expected to be completed by the end of 2019 and will result in two separate ASX listed companies, GrainCorp and MaltCo. The initiative will allow for the acceleration of a number of cost reduction initiatives. The Financials sector closed lower. The big four banks all declined 0.2% – 0.7%, with NAB leading the losses. The Australian futures market points to a 0.14% fall today. European sharemarkets were mixed on Thursday. The broad based STOXX Europe 600 fell 0.3% and the UK FTSE 100 lost 0.2%, while the German DAX rose 0.3%. US sharemarkets were also mixed overnight, as investors await news on US-China trade talks. Boeing rose 2.8% as investigations continue into the fatal crash of an Ethiopian Airlines jet. Boeing reportedly said "its software fix for its anti-stall system would give pilots the authority to always override the system if activated by faulty sensor data". Tesla fell 8.2% on news that deliveries of electric vehicles fell 31% in the first quarter. By the close of trade, the Dow Jones rose 0.6% and the S&P 500 added 0.2%, while the NASDAQ fell 0.1%. 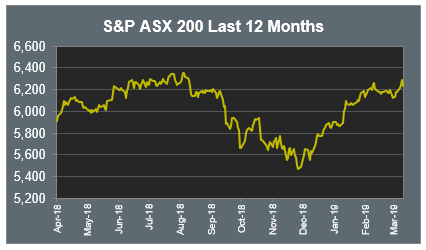 While the fall in global equity markets in the last quarter of 2018 was certainly challenging for investors, the rapid recovery in the first quarter of 2019 has been rewarding. Despite all the initial doom and gloom during the final quarter of 2018, the first quarter of 2019 will be remembered as one of the strongest quarters post GFC. It is already being dubbed as one of the most memorable on record, given the sheer broadness of positive returns across asset classes. As can be seen in the chart below, showing total returns for the March quarter in local currency terms, 37 of the 38 asset classes finished in positive return territory. Oil (+32.4%) and the S&P 500 (+13.6%) since Q2 2009. US high-yield bonds (+7.5%) since Q4 2011. China’s Shanghai Composite (+23.9%) since Q4 2014. Europe’s STOXX 600 (+13.3%) since Q1 2015.